This page makes the synthesis of the variants proposed for this game. The variants proposed in the rules of the original game are presented here. Then those described in a "hors séries" of Casus Belli the author of which is Bruno Faidutti. Some of these variants are specific to the extension of the game: the Modular Board. Finally, the others, proposed by Simon R.. The original game, such it is, allow the most well-balanced games. But you can venture farther. If you wish to get familiar with the so capricious phenomenon of tides and with the carriers usage, you can leave tanks and patrol boats with the cemetery, and play only the ore harvester, without aggression nor capture of spaceships. To drill you in the fights, it is possible to play "war-only" without putting the ore (take from the beginning your equipment from the reserve). The confirmed players can decide to increase the basic credit to 20 or 25 action points. For his first game, it is fashionable to grant to a beginner four minutes (instead of three) to play his turn. True Full Metal Pilots paints their equipment in their colours, and plant their emblem at the top of their spaceship. For faster game, it is possible to fold up one of the volets of the board to play on a smaller map. Full Metal Planète's board cab be matched properly: mountains, lakes, swamps match properly. To make it, place boards in the same or opposite direction. If one of your friends has too a Full Metal Planète box, deprive you of the pleasure of a game to no more than four players, or with more units. If Full Metal Planète pleased you, it will have no other limits than your imagination. Good luck on the West of the Galaxy. This variant, that the inventors of the game practise most gladly, can be played only with the Modular Board. It is thus a reason furthermore, if you have not made it yet, to buy this very useful accessory. 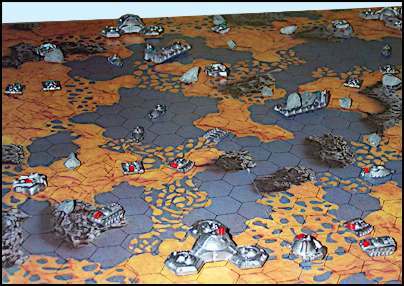 Elements (big hexagons) of the board of game are placed hidden face, a thick fog preventing the functioning of the radars of the spaceship. Before putting his spaceship, a player has to return the element on which he wants to land, then takes place as he wishes it on that this. We cannot land on a nearby element of that where landed another player. When it is technically impossible to land on the returned element, the player returns a nearby element and lands on this last one. The deployement of units is made on the whole returned element. Afterward, an element can be returned of two manners. Once per turn, a wheather layer being at the edge of an element can return a nearby element. It does not cost any point. Furthermore, we can move any unit into a precise cell of an unknown element which then be returned. The unit takes the risk of being aground, stuck and even being lost in deep sea. In that case, the unit is destroyed. Every time a player discovers an element, he chooses the axis of rotation before returning it. It is forbidden to look at an element before deciding how placing it. Every time an element is returned, we spread some ore above. Ores are placed every three cells by taking for base the place where landed the first one. Any ore situated at a distance lower or equal to three cells with regard to a spaceship disappears. The game without visibility harmonizes perfectly with the variant of two spaceships described in the extension. It is even this redoubtable combination which is henceforth used for the training of the pilots of the Ludodélirium Extracting and Shipping Company. All the rules of both variants are applied. The second spaceship can land on an already returned element, at more than five cells (pod to pod) of quite other spaceship. It can also try to land in the same conditions on a not yet returned element. If this operation is not possible, it will have to land on both element and otherwise, on a nearby element. No logical reason opposes a carrier to load a patrol boat. In that case, it is obvious that she must be load or unload from/to a submerged cell. During the game taking place on the basic board, the players found little interest in investigating the central zone where they expose) themselves to the fire of their enemies for a generally reduced profit. We can mitigate this light defect by placing on the big central island and on the small nearby island a piece of ore every two cells. For the simple pleasure to change or to adapt itself to specific map, the players can unanimously establish a reserve a little bit different from as usual. Some supplementary tanks so promise a more animated game. Patrol boats addition can strengthen the role of this too often neglected unit. A wheather layer is then capable of making a patrol boat on an submerged cell neighbour of the cell where it is. The more the board game is vast and the number of players reduces, the more the reserve must be supplied. Never put it big tank, it would destabilize too much the game. Originally, a simple do-it-yourself realized by a technician in the holds of an old spaceship of the Asian Extractor Company, the patrol boat K-2 Tarask, henceforth produced by Japanese Cosmos Factory, is used by certain mining companies. If its motorization remains classic, it was equipped with the same redoubtable gun as the T-99 Big Tank, what allows it to fire at a three cells range. For a more murderous game, especially on a big map, we can so include in every army a classic patrol boat and a patrol boat Tarask. No player can, in his army to possess more than two unit firing at three cells (Big tank or Tarask). As comparison, a "standard" army cost exactly 30 points. The armies so obtained are thus slightly more powerful than those to whom you are used. Once all the ore is spread in a standard way on the board game, every cell which is three cells or more than an already put ore can receive a new ore. This rule allows to homogenize the distribution of the ore, in particular in the seaside and in the edge of board. The number of ores being more important, the scores of these game are slightly increased. But especially, the main interest of this rule is, thanks to the supplementary resources, to play fuller of life and more aggressive game! This rule is strongly recommended. Only three minutes are granted to every pilot to play their turn. It is a relatively short period at certain moments and it brings some salt to the game. The pilot playing does not thus waste time watching the stopwatch! This rule consists in making announce by another player the entrance in the last 30 seconds, so that there are no too stupid movements due to the haste. If this period is not announced, the granted time is prolonged of 30 seconds from the end of statutory time or announcement of the last 30 seconds (what arrives first). This rule of "fair play" is advised to maintain a good atmosphere during competed games. The management of tides, such as the basic rule can become very painful when a pilot arranges several weather layers. This is particularly true in the approach of the turns 11 and 19 where cards tides have to be shuffle. It is even more true for game with more than four players, while the same pilot can begin to collect weather layer (imagine a game with 16 players!). Now, with experience, the knowledge of several future tides does not bring big matter in the game. This rule limits to 1 the number of future predictable tide. What means that to have one or several active weather layers has the same effect on the meteorological forecast. This rule is strongly recommended, especially when there is a lot of spaceships.